Friday March 23rd 1883 I was busy about the house all the forenoon We sent for Hatt after dinner and she brought Edith with her. I helped work on the carpet rags in the afternoon and worked on my pillow case in the eve. 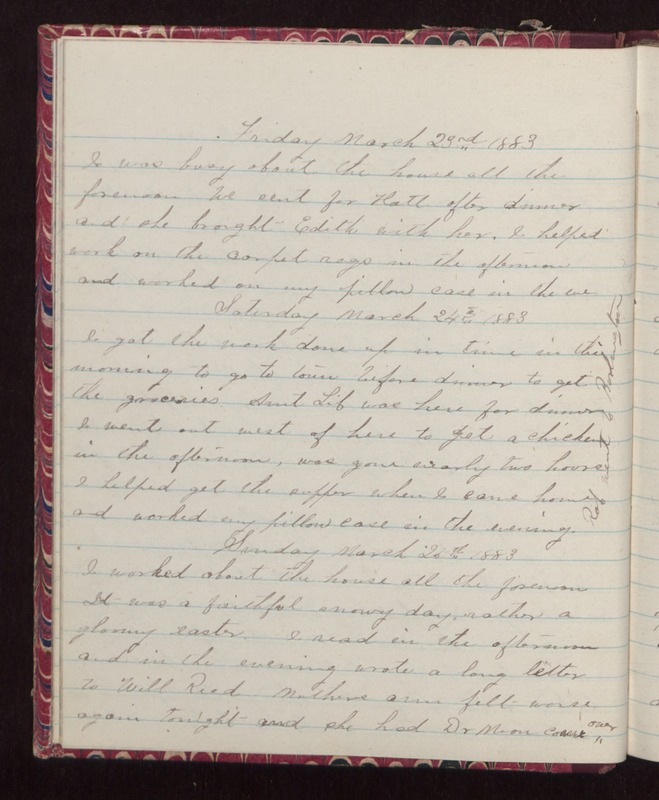 Saturday March 24th 1883 I got the work done up in time in the morning to go to town before dinner to get the groceries. Aunt Lib was here for dinner I went out west of here to get a chicken in the afternoon, was gone nearly two hours. I helped get the supper when I came home and worked my pillow case in the evening. Rob went to Burlington. Sunday March 25th 1883 I worked about the house all the forenoon It was a faithful snowy day, rather a gloomy easter. I read in the afternoon and in the evening wrote a long letter to Will Reed. Mothers arm felt worse again tonight and she had Dr Moon come over.